It could just be the largest virtual library of public domain music scores, or at least the largest one I have ever stumbled upon. The International Music Score Library Project, also known as the Petrucci Music Library after Ottaviano Petrucci (credited with producing the first book of sheet music in 1501), holds over 83,000 scores with 1,500 recordings for over 33,000 works of over 4,700 composers. So if you u need some music scores, want to learn more about different time periods in music history and its composers, or simply want to download some of the greatest compositions, this site is a gem. And beginning January 22 of 2011 it also started to support video recordings. It launched on February 16, 2006 and consists mainly of scans of musical editions that are currently out of copyright. However, the site also admits music by more contemporary composers who decided to share their work under the Creative Commons license. It employed Media Wiki software to provide the users with the easy to use and familiar interface. You can browse by composer alphabetically or by time period ranging from ancient to renaissance to modern. You can also browse by instrumentation or genre, or use the entirely new option to browse only those composers for which you can directly download the recordings. The website also keeps a music blog with articles touching a variety of music-related topics from the academic to the casual. IMSLP has several projects currently under its belt. However, one of the main projects already completed in 2008, include sorting and uploading the complete works by Joahnn Sebastian Bach. Currently next to Bach, all of Beethoven’s, Brahms’s, Canteloube’s, Chabrier’s, Chausson’s, Chopin’s (download my favorite Andante Spianato, Op.22 here), Corelli’s, Debussy’s, D’Indy’s, Dukas’s, Fauré’s, Ferroud’s, Handel’s, Huré’s, Magnard’s, Palestrina’s, Ravel’s, Roussel’s, Satie’s, Schmitt’s, Schubert’s, Schumann’s, Scriabin’s, Sibelius’s, a large percentage of Mozart’s, Liszt’s, and others are available as well. 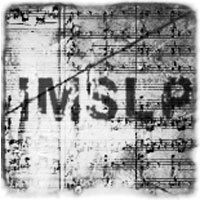 IMSLP is much more than a virtual library, in fact it is also called a musicological encyclopedia as analyses and historical commentaries often accompany uploaded compositions. What is even more, it is highly recommended and used by OpenCourseWare, MIT, Stanford, Brown, University of Wisconsin-Madison, University of Melbourne, and many other academic institutions. However, remember that the servers of IMSLP are located in EU and Canada, and although the copyright laws are in many instances similar across the countries they are not identical. For the benefit of the users around the world, IMSLP has been using a very strict copyright policy as the uploaded files are only made accessible for download after the copyright status for three most known copyright regimes have been reviewed by the staff members, and if a certain upload still did not enter the public domain in the United States they would be often flagged for ‘Technical Block’ or ‘Temporary Block’ and could not be therefore downloaded.